"Should've Seen It Coming clearly demonstrates why Krase has been consistently nominated in multiple categories year after year by the Houston Press Music Awards and why he was a semi-finalist in the 2017 International Blues Challenge in Memphis. Every track on the album shimmers with brilliant musical power that we definitely should have seen coming." "Certainly a solid recording as Krase is a very good singer and striking harmonica player with adept, steady support, and fresh material and takes on older songs making for a totally engaging recording." "In a nutshell, Krase says he always tries 'to make a fun record that people want to turn up loud at a party.' This one fits that bill. No question." "Here comes a highly recommended good blues album you should not ignore. GREAT." "It's hard to find any kind of bad moments on this album. Here's one great record for all blues lovers." "On the song, Crazy For My Baby, Steve puts himself in the league with Little Walter, James Cotton, and Charlie Musselwhite with an excellent harmonica rendition of a Willie Dixon tune. This song should receive serious consideration in the harmonica artist category of next year’s blues awards in Memphis." "Should've Seen It Coming is a party album, with a two drink minimum." "Incredibly upbeat, but exquisitely lowdown in just the right places, this is a set of soulful blues within which the groove consistently rules." "Krase and company are a taut tour de force sure to get venues and festivals heated up with their boisterous, good time sounds. Superb!" "Krase is one of those guys you want to keep an eye on. He’s constantly moving and shaking and experimenting with new sounds and new people, and doing what he can to bring the blues to a wider audience. " "Here Krase takes the vocal mic as well, and brings his tight, good-time band to fore, with a set of band originals and cool covers. As you'd expect, and hope, there's plenty of sharp harp punctuating each cut. What I like about him is that he's not a huffer-and-puffer; he's controlling the thing, to make sure he's getting the right melody and solo lines out of it." "Krase blows harp the way Stevie Ray Vaughn played guitar- with attitude and sass, bending the notes to his will, so it’s no wonder that he has been recognized in multiple categories over the years by the Houston Press Music Awards, most recently in 2016 as “best player”. He was also a semi-finalist recently at the 2017 International Blues Challenge in Memphis." 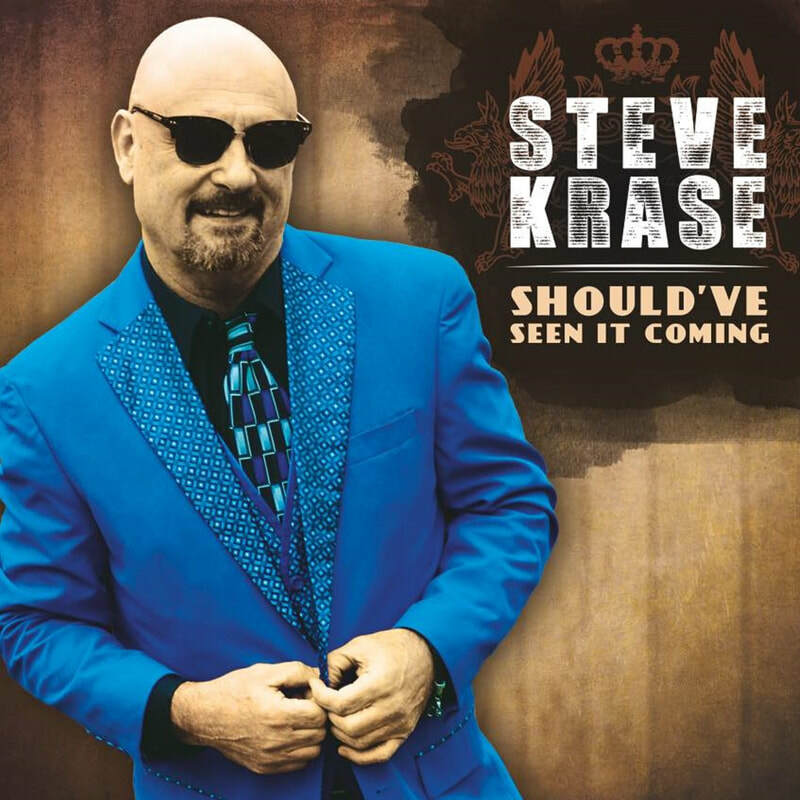 "Blues harmonica virtuoso Steve Krase has released his latest album, Should’ve Seen It Coming, and it is a party of a playlist. If you need to get things going, put this disc on; it is all about ignition. The production values are up to the high standard of each superb instrumentalist and Steve Krase’s smooth vocals communicate every nuance in every lyric." "All in all, [Should've Seen It Coming] does exactly what it’s supposed to do. It puts you in a great mood. Whether it’s an at-home fiesta, or a long road trip, Should’ve Seen it Coming will keep the party going. Just take Steve’s advice and, 'Turn it up!'" "Steve Krase is a real harmonica virtuoso with a smooth blues voice. The sound is touching, and let's swing us from start to finish! Great recording! (5 stars)"
"Nothing beats a good live show...and Should've Seen It Coming captures it perfectly. This one is a keeper...and may just make my top picks for the year. It is THAT good. Don't let this one slip through your fingers." "There are enough musical surprises here to please anyone. Krase proves himself a great bandleader. This is Krase’s best to date." "With everything blazing on all burners, [Should've Seen It Coming] that takes the best of Chicago, Memphis and Houston moves and mixes them together for a hot time delivers the good throughout. Well done."